1. Prioritize organic meat and dairy. Due to the use of hormones, pharmaceuticals and pesticides in the production of meat and dairy, these items should be your highest priority to buy organic. If completely organic dairy will put too much of a strain on your budget, at least buy the rBGH-free (recombinant Bovine Growth Hormone) dairy. While this doesn’t guarantee the animals have been given feed raised without pesticides, at least you know the cows weren’t treated with hormones. Similarly with beef, if organic or grassfed beef is out of your price range, at least make sure to buy beef that is raised with hormones, as estrogen is routinely used in raising conventional beef. 2. Choose lower cost cuts of meat. It’s much less expensive to buy a whole chicken than boneless skinless chicken breasts or any one part of the chicken. Roast a chicken whole with onions, carrots, and beets, or cook a whole chicken in the crock pot.Alternatively, ground beef, for example, is less expensive than buying steak. Use ground meat to make some homemade chili, tacos, enchiladas, meatballs or any of your favorite recipes. Serve with plenty of vegetables. 3. Eat eggs. 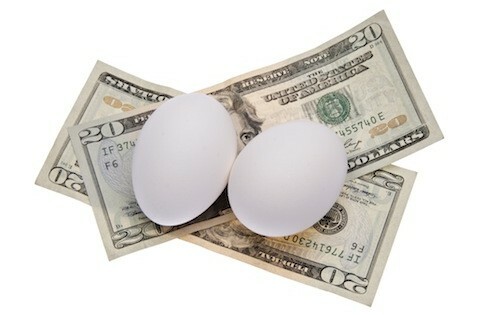 They’re nutrient-rich, and even the most expensive organic eggs usually don’t cost more than $5 per dozen. Hardboiled eggs are great for healthy snacks, or make veggie omelets, quiche, frittatas, or egg bakes for any meal. 4. Buy in bulk. Save money by buying beans, nuts and seeds, and alternative flours like coconut and almond flour in the bulk section. It’s usually significantly less expensive than buying the prepackaged version. 5. Learn about the Dirty Dozen. These 12 fruits and vegetables have the highest pesticide residues, so spend some extra money buying organic spinach and strawberries. The Clean 15 are the fruits and vegetables with the lowest pesticide residues, so save money by buying the conventional versions of these items like onions and avocados. 6. Cook at home instead of eating out. You can serve a delicious home-cooked dinner for 2 or more at a fraction of the cost of eating out or ordering in. When you have extra time, stock up your freezer with healthy homemade soups and other meals that you can quickly reheat after a long day at work when there isn’t time to cook. 7. Do price comparisons. Some of the major chain grocery stores actually have higher prices in their natural foods section compared to your natural foods grocery store or coop. The opposite can also be true. This may require trips to multiple stores, but it can definitely help to trim your food budget. 8. Eliminate high-cost low-nutrient foods. An excellent example of this is cold cereal. Cold cereals are generally quite expensive, not well-digested and their vitamin and mineral content is generally due to a spray-on multivitamin not because it’s actually a nutrient-dense food. Meanwhile you can generally buy 1 pound of organic oats in bulk for less than $2. Cut out other foods like packaged cookies and sweets that often have a high price tag for no nutritional value. 9. Eat beans. Cooking beans from dry is your best bet for avoiding BPA and saving money. I cook mine in the pressure cooker using the method on Cookus Interruptus. They turn out great and can be used in soups, enchiladas, for baking a hummus or bean dip, or adding to eggs and meats. Cook a large batch, use some in a recipe, and freeze the rest for later use. 10. Eat organ meats. I hope you aren’t cringing at the thought, but organ meats like liver and hearts are highly nutritious and used to be eaten regularly. Chicken liver is rich in iron, folate, vitamin B12, and vitamin A. Here in Wisconsin, we have access to hormone and antibiotic free meats from Black Earth Meats including a blend of offal (various organ meats) that can be incorporated into meatballs, burgers, and meat loaf. Since organ meats tend to be unpopular, they are often relatively inexpensive. 11. Buy direct or from discount sites. You can get beans in BPA-free cans, ground flaxseed, hemp seeds, and coconut and almond flour at better prices than the grocery store from Vitacost.com. They offer free shipping on orders over $49, so stocking up can be a great way to save some money. 12. Plan ahead. Making meals from scratch and freezing them is generally much cheaper than buying a frozen dinner. 13. Pick your own and freeze. I’m a big fan of picking my own berries in the summer and freezing them to eat all year long. You pay less when you pick them yourself, and you won’t have to pay the higher prices for fruit in the winter (if you live in a northern climate like I do.) Try out my low sugar freezer jam for another great way to preserve the harvest. 14. Shop the farmer’s market. When there’s a bumper crop of something, you can often find great deals like a few cucumbers for just $1 here in Madison. When you get a good deal, preserve the harvest through canning, freezing, and dehydrating.